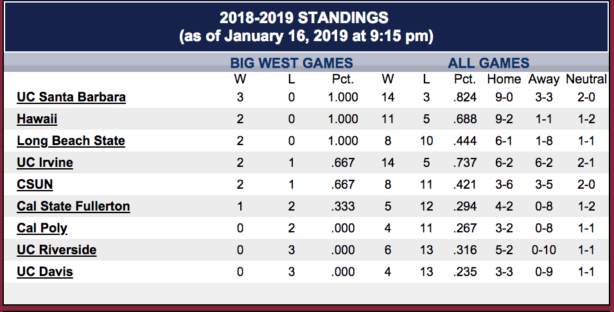 At least one team will be 3-0 and atop the Big West Conference standings after Saturday night. 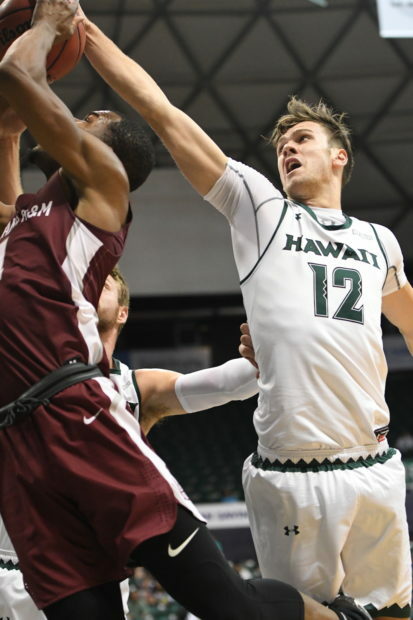 The University of Hawai’i basketball team is looking to be one of them. 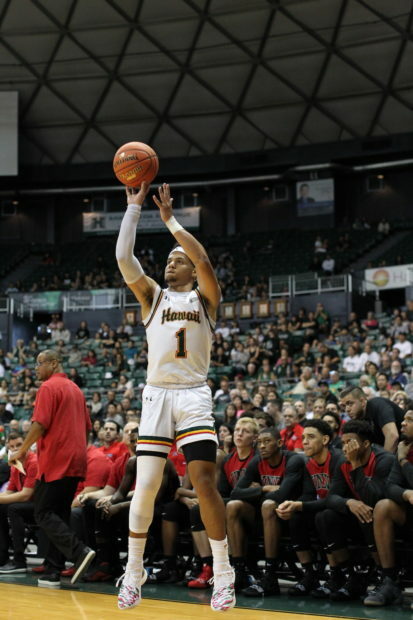 The Rainbow Warriors will take their five-game winning streak to UC Riverside for a conference game at the SRC Arena in Riverside, Calif., on Saturday. It is scheduled to start at 5:00 p.m. Pacific Time (3:00 p.m. Hawai’i time), and will be available via streaming video on ESPN3.com. It will be a matchup of teams heading in opposite directions in the early portion of the Big West season. Hawai’i is 11-5 overall and 2-0 in the conference following an 84-79 road win at CSUN on Thursday. The Highlanders are 6-13 and 0-3, and have lost five of their last six games, including a 69-61 road loss at Cal State Fullerton on Thursday. The Warriors’ winning streak has been built on teamwork. Junior guard Eddie Stansberry leads the offense with 14.1 points per game and 51 3-pointers, which ranks second in the conference. Junior forward Zigmars Raimo is averaging 11.4 points and 7.0 rebounds per game, and ranks third in the Big West with a .560 field goal percentage. Senior forward Jack Purchase is averaging 11.1 points, 6.5 rebounds and 2.3 assists per game, and ranks second on the team with 37 3-pointers. The guard rotation of sophomore Drew Buggs (8.8 points, 5.3 assists, 4.6 rebounds per game), senior Brocke Stepteau (9.9 points, 2.8 assists per game) and senior Sheriff Drammeh (7.1 points, 2.7 rebounds per game) has also been crucial to the recent success. The current five-game win streak is the longest since the 2015-16 team had separate streaks of eight and six wins in a row. The 2015-16 team went on to win the Big West regular season and tournament championships. Riverside’s SRC Arena is not exactly a hostile environment, with an average of 650 fans per game (lowest in the Big West). The Warriors have a record of 5-1 in games played in Riverside since joining the Big West in the 2012-13 season. This season, the Highlanders are in rebuild mode under first-year head coach David Patrick. Among the nine players who normally see game action, four are freshmen, three are sophomores, one is a junior and one is a senior. Still, UCR is dangerous for a couple of reasons. For one, the Highlanders lead the Big West in 3-pointers made (8.8 per game) and free throw percentage (.716). They also have an all-conference candidate in Dikymbe Martin, a 6-foot-1 junior guard. He is averaging 16.1 points, 3.5 rebounds and 2.8 assists per game. He also leads the team with 40 3-pointers and is shooting 44.9 percent from 3-point range. The Highlanders also have some size. Most notable, 7-foot senior center Menno Dijkstra is averaging 8.1 points and 3.9 rebounds per game. Ajani Kennedy, a 6-8 sophomore forward, is averaging 8.6 points and 4.8 rebounds per game, and is shooting a conference-best 53.7 percent from 3-point range (22 for 41). Dragan Elkaz, a 6-5 freshman, is averaging 7.5 points per game and is second on the team with 38 3-pointers. He is from Australia, as is the head coach Patrick. Three other touted Australian recruits are expected to join the UCR program next season. Hawai’i’s Purchase, who is also from Australia, said the UC Riverside coach is a longtime family friend. Where: SRC Arena (3,168) – Riverside, Calif. If Hawaii wins today on the road, I will be convinced that Hawaii’s treacherous road trip that included Seton Hall and UCLA probably had a good role in preparing them for the Big West season.